After tilling your garden this fall to turn over sod and mix in organic matter, it will be time to put your Honda tiller into storage. Taking steps to protect your equipment now will make it easier to get it up and running in the spring. Are the tines straight? Do they show severe wear or signs of cracking? If the tiller has a belt drive, is the belt still tight? Is it starting to crack? Is the spark plug, fuel hose, and air filter still in good condition? Let the engine cool for at least a half hour before cleaning: rapid cooling caused by water making contact with hot engine parts can cause warping. A garden hose or pressure washer can be used, but the water should not be aimed at the controls, cables, air filter, belts or muffler. A rag or stiff brush can be used to remove dirt trapped near these sensitive areas. Once clean, wipe any remaining moisture off of the tiller. To get rid of the last bit of water, start the engine and let it run until it reaches normal operating temperature. If the mower has a clutch, operate the clutch lever several times to remove any water clinging to the pulleys and belts. Even stabilized fuel should not be kept in your tiller’s engine for longer than three months. Before putting it into long term storage, the fuel system should be drained completely. On models with a Mini 4-Stroke engine, open the gas cap and tip the tiller so that the gas pours out into a container. Once the tank is empty, squeeze the priming bulb to remove any remaining gas in the carburetor. On models with larger engines, place a fuel container underneath the carburetor and unscrew the gas cap. Open the fuel valve and unscrew the fuel drain bolt or knob at the bottom of the carburetor. Newer models like the FC 600 also have a sediment cup to the right of the drain knob: once the fuel has drained, unscrew this cup, clean out any fuel and debris, and reinstall the cup, fitting a new O-ring to ensure a tight seal. Screw the bolt or knob back into the carburetor once the tank and carburetor are empty. If your tiller has a separate transmission, the fluid inside does not need attention before you put your equipment in storage aside from checking the level. On all models, the engine oil should be changed, and the cylinder should be lubricated to prevent rust. To lubricate the cylinder, first, remove the spark plug. For Mini 4 Stroke engines, pour a quarter teaspoon of clean engine oil into the spark plug hole. For other engines, add one teaspoon of oil. Pull the starter handle several times to circulate the oil inside the cylinder, then reinstall the spark plug. Pull the starter handle gently until resistance is felt. This positions the valve train so that both the intake and exhaust valves are closed, sealing the combustion chamber. When the tiller is put back into service, it’s normal for the motor to smoke for a few seconds as the oil in the cylinder is burnt off. To keep rust from forming during storage, chipped and damaged paint should be covered in a touch-up paint, while bare metal surfaces should get a light coat of oil or silicone lubricant. Even with the fuel tank and carburetor drained, there may still be enough fuel inside of your tiller to release flammable vapors. Keep the tiller in an area that doesn’t have an open flame or sparks nearby. This includes avoiding power tools, heaters, clothes dryers and water heaters. To prevent rust, the tiller should be stored in an area with low humidity. Placing a tarp over the tiller can trap moisture, accelerating rust formation. If you fold the handle to make the tiller more compact, make sure the cables aren’t kinked or wedged between the upper and lower handle. 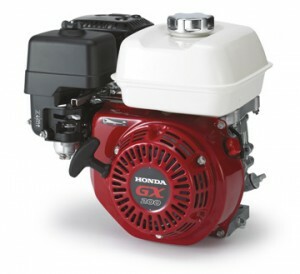 From small maintenance parts like O-rings and spark plugs up to major components including tines and engine covers, if it’s Honda, you can find it at Hondalawnparts.com. We’re a certified Honda Small Engine and Power Equipment dealer, and our massive parts stock lets us ship parts quickly across the U.S. and Canada. While the proliferation of Lithium-Ion technology has made portable tools a more viable choice in construction, there’s plenty of equipment that needs AC power. 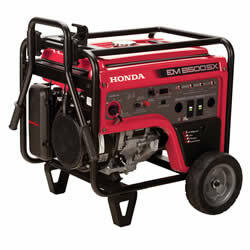 To serve these users, Honda makes the EB-Series of generators. They’re built for the demands of commercial and rental use, are offered a range of outputs, use low noise designs and are OSHA compliant. How do you know which one is right for you? Here’s what you need to know to work out your use case. 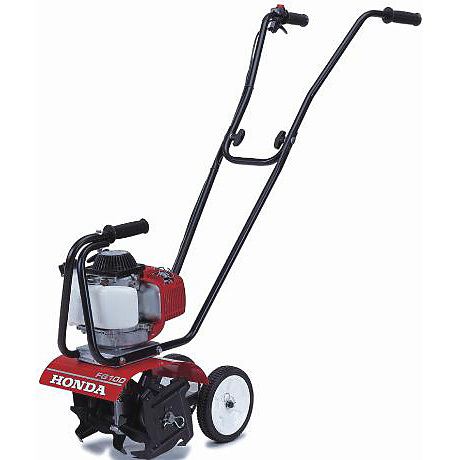 As a general rule of thumb, Honda recommends a 2,000 watt generator to run a single tool, 3,000-4,000 watts to run two tools and over 4,000 watts to run several tools. However, your specific use case can vary a lot depending on the equipment that will be drawing power from the generator. The easiest way to calculate the power needed for a tool or appliance is to check the data tag, usually located on the body of the device. If this tag has worn off, the same information can usually be found in the owner’s manual, or measured using an appliance load tester. To convert amps into watts, multiply the rated amps by the voltage, either 120 or 240. For example, if you have a ¼ hp drill press with a “P” code, it requires 29.15 amps to start or 3,498 watts. If there is no code or second number, assume the starting power will be three times as much as the running power. When calculating power demands, remember that you probably won’t be turning all your devices on at the same time. The generator you buy should be able to support all the equipment you may be using at one time plus the highest single reactive load for your equipment. Can I Power Electronics with an Industrial Generator? Inverter generators including CycloConverter models like the EB3000c create a clean power waveform, making them safe to use with electronics as well as tools with computerized control systems. This means you can use them to power Li-Ion charging stations, computers, and radios. Can I Power Three Phase Equipment with a Generator? No. While most EB models can provide 240-volt power, this electricity is single phase, switching fully between negative and positive polarity. In a three phase system, three power waveforms are combined, keeping the polarity fairly steady. Welders and some large electric motors need three phase power to work properly. OSHA has specific requirements for generators used in the workplace covering fire safety, grounding and circuit protection. The NFPA issues rules for fire compliance to meet OSHA’s requirements. All Honda EB Series generators are OSHA compliant. The NFPA issues guidelines for using generators for emergency backup power for all users, commercial and private. 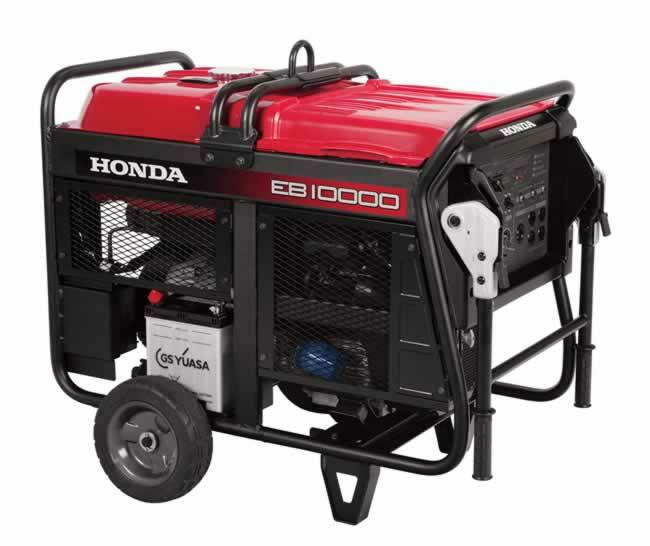 All Honda generators comply with NFPA regulations if they’re installed and used correctly. Full compliance requires correct usage of the generator, which includes keeping it outside of buildings and away from walls to prevent carbon monoxide poisoning. When adding a generator to your equipment, you’ll need to have a way to get that power to the work area via cables and weather protection to prevent shorts from rain. 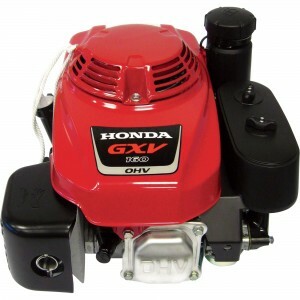 Hondalawnparts.com is a certified Honda Power Equipment dealer, so we can offer OEM parts and accessories to keep your generator working including cables, transfer switches and load testers. Our massive warehouse lets us keep most popular parts in stock for fast shipping to any address in the U.S. or Canada.